My name is Olipurr Queen... that's a famous quote from a famous TV show. 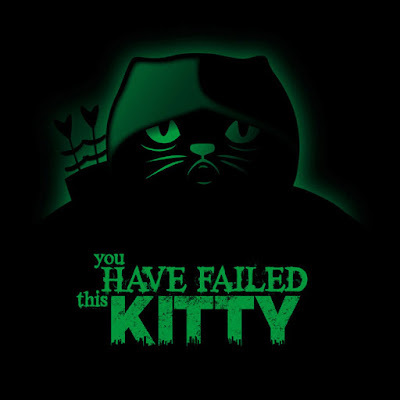 And another popular one is YOU HAVE FAILED THIS KITTY! Yeah, that's my favorite, no doubt. Now you can get this awesome t-shirt at PopUpTee in their limited edition sale, July 30th - August 2nd. Don't miss it! In case you're late, you can always get it at my regular stores: Neatoshop, Redbubble, Teepublic and La Tostadora.